Even though I’ve been playing quite a bit on Tribble over the last few weeks, it’s still really good to have the ground combat update on Holodeck. It’s completely a perception issue on my part, but knowing I’m playing on Holodeck gives me more of a sense of permanence that’s just not there when I play on Tribble. Tribble is like Vegas. You go there to have fun and goof off, but it doesn’t count. I logged in on my main Bryn and headed out to Gamma Orionis. One of the things I’ve been waiting to do is replay Assimilation. 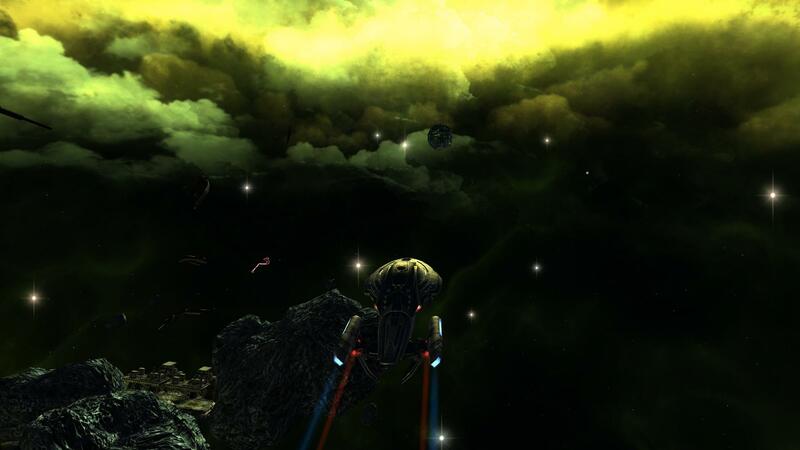 This mission is part of the Undine front missions and includes the Universal Assimilated Module, which was added as part of the Borg equipment set after I’d finished that chain of missions. Pre-Season 4, Assimilation was one of my least favorite of the story missions. There’s a ton of Borg ground combat in that mission, and I remember dying while playing it. Possibly it was just because I was Science, possibly I wasn’t doing something correctly, but I think it was because of the way ground combat worked. Melee enemies tended to run up on me, so battles largely consisted of running backwards in circles trying to shoot enemies. Not fun. Now that Season 4 is here, I picked up the replay from my Ready Room console and headed to NGC-4447. After completing a few space objectives, it was time to beam in with Bryn’s team. I started playing the mission completely in shooter mode but part way through I had to change that to just toggling into shooter mode before starting combat after accidentally clicking my mouse a few times and shooting Borg’s in alcoves. Turns out they don’t like that. The new content was fun enough that I started out just clearing out all of the Borg I ran across even if they weren’t hostile. I only started switching my Boffs to passive mode and leaving Borg alone once I saw how late it was. I had a lot more fun than the first time I ran the mission. I made it all the way through the mission without dying once, although I did have to resuscitate my two tactical officers a few times. The pacing was faster, the battles were more engaging, and dodging behind walls worked well to break aggro and give my personal shields time to recharge. The kits are much more effective as well. I hadn’t really noticed on Tribble, but I was using a Physicist Kit and dropping an Exothermic Induction Field (EIF) on a group of Borg did a noticeable amount of damage. Pre-Season 4, most of the DoT’s in Science Kits seemed more like bonus damage than actual attacks. Often, I would just use the roots and shield debuffs and that was it. Now though, using EIF or Hyperonic Radiation, has a noticeable effect. There were several instances where DoTs killed Borg that were down to a quarter of their life who had adapted their shields before I was able to remodulate my weapon. I know there are issues with Season 4, especially for the Foundry, but I’m still really happy with the update. I’m really looking forward to leveling up my alts now that I can look forward to both types of combat in the game.